You’ll notice there are no quantities given, just ingredients. That’s because everyone likes their Provencal a little different. Here’s how it worked out the other night. This is a great “I’ve got a lot of people coming and not much time dish.” There were 7 or 8 of us for dinner and I started about 15 minutes before everyone got there. Served with some rice, salad and a watermelon for dessert. Easy, satisfying, not much clean up. That’s pretty much a trifecta in my book. Melt the butter over low heat, adding ¼ of the wine, as you will be cooking the shrimp in batches, unless you have a really big pan and a lot of low burner heat. 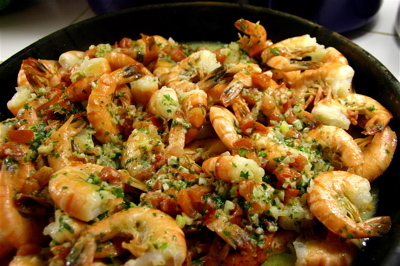 Using a slotted spoon, transfer the cooked shrimp to a serving dish and keep warm. Cook the remaining shrimp, adding more butter and wine as needed. When all the shrimp have cooked and are waiting patiently in the serving dish, toss the garlic and parsley into the butter/wine pan adding any remaining butter or wine. Pour over the shrimp and your done. Told you it was easy. This is best when eaten with your fingers, then you are meant to lick your fingers. Paper napkins might be a good idea; along with wine, friends and laughter.